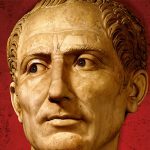 Because I have been working on a story about Julius Caesar’s short visit to A.D. 2000, I pose this question to myself often, along with “What would Julius Caesar do?” and “What would Julius Caesar say?” At first, I wondered about his potential reaction to cars and airplanes and women wearing yoga pants. I progressed to TV, photographs, and animated neon signs. Everywhere I went, it seemed, there was something I could wonder about, from ice cubes and iPods to pencils and plastic bags. Just about everything that caused my brain’s gears to engage was related to technology. We take internal combustion engines and electricity for granted. Julius Caesar’s go-to energy sources were self, animals, and fire. It’s easy to imagine the extreme culture shock a man like Julius Caesar would experience if he were snatched to our world. I have found it also easy to imagine that he would rather quickly come to grips with the superficial differences. He was a world traveler, after all, an intelligent, educated nobleman. Yes, he might be freaked out at first, but he’d look for things he could recognize and find a way to understand our society in familiar terms. A car, for example, is a horseless litter, and an electric light is a flameless lamp. He might still find our innovations startling, but he could rapidly match most of them up with the analogous items in his own world. As I continued to ponder a meeting between Caesar and the modern world, it occurred to me that while we have the upper hand in technology, he would be far ahead of us in other ways. Take memory, for example. In a world without recording devices and photography, memory is a vital skill. Caesar would have been honing his since childhood. Our educational practices no longer focus on developing memory. With external memory always at hand, we don’t even need to know our own telephone numbers. Digital photography lets us snap pictures of anything we might need to remind ourselves of later, from the calorie content of a granola bar to the spot we parked our car. Smart phones allow us to keep the Internet always at hand. We don’t even have to remember jokes. There will come a day when learning other languages will be a choice but not a necessity, just like handwriting. It’s as though we are gradually outsourcing all our skills, giving our minds and bodies ever more leisure. We must seek out exercise—both physical and mental—rather than relying on our everyday lives to provide us with enough. Caesar didn’t have to. Even when he wasn’t on a battlefield, he wouldn’t have needed CrossFit to keep his muscles toned. His ordinary daily life gave his brain a workout, too. As I look at our world, I try to see it through Caesar’s eyes and ask the questions he might ask. “Where are all the animals?” is one. “Why is everyone so tall and fat?” is another. He might well wonder about all the old people, too. Perhaps it is a good thing that time travel remains an elusive phenomenon. It leaves me with questions I can’t Google, meaning I must rely on my own brain and the brains of others to find answers. So I leave you with the question and would value your thoughts. If Julius Caesar turned up in the year 2000, what would he think? In the London City Museum is a diorama of Roman London, along with common household artifacts from that time. It could have been the nineteenth century! The change in our tools in the past two centuries is unprecedented. Good point. Things have really sped up of late. Caesar would have felt much more at home in 1860.
what would impress him more?